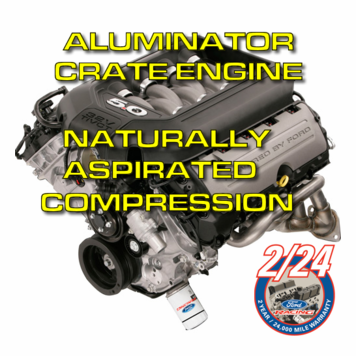 Ford Racing has taken the Mustang GT 5.0L 4V TiVCT engine and created another in its series of "Aluminator" crate engines built to deliver higher performance. The 5.0 Aluminator NA is built with extreme duty connecting rods and pistons designed specifically for high performance applications. Mahle 11.0:1 compression ratio forged pistons are hard anodized with Graphal low friction coating. The connecting rods are premium Manley H-beam with ARP 2000 bolts and fitted with BOSS 302 high performance bearings. 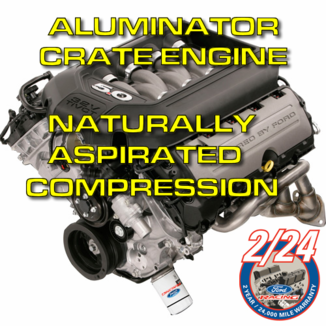 The 5.0L Aluminator NA is a direct bolt in for 2011-2012 Mustang GT. It can be used in street rod or resto-mod builds using Ford Racing's 5.0L engine controls pack. Part No: M-6017-A504V. -Vehicle harness and PCM not included. Use Ford Racing wiring, PCM and installation kit M-6017-A504V designed for street rod/project car installation. -Engine mount bosses and bellhousing mount pattern common to 4.6L modular engines.